When I was a child Sunday night was the only time we were allowed to eat dinner in front of the TV. I have memories of watching Disney movies, Dukes of Hazard and MacGyver. It was also a night of comfort food – macaroni cheese, cauliflower cheese and soup and homemade bread being favourites. 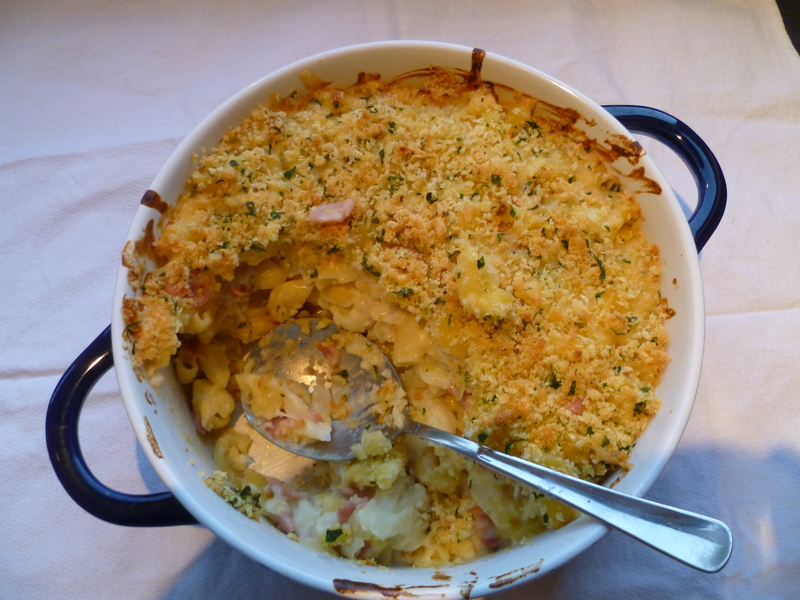 This is a combination of 2 of those foods – macaroni cheese and cauliflower cheese. It mostly contains things you are likely to have in the cupboard, and you could substitute different ingredients if you don’t have some of them. So hop in the kitchen and MacGyver up some dinner from whatever you can find in there! Heat oven to 200 C fanbake. Bring a pot of water to the boil and add the macaroni. Cook for 3 mins. Add the cauliflower to the pot, or I put them in a steamer over the macaroni. Cook cauliflower and pasta for 8 mins. Drain well. While this is cooking heat oil in the frying pan and add onion and bacon. Cook, stirring occasionally until onion is soft. For cheese sauce melt butter in a pot over a lowish heat. Use a whisk to stir in flour off the heat, the whisk helps avoid lumps in the cheese sauce. Put back on the heat and slowly add milk, stopping to whisk it into the sauce. Take off the heat if you need to. Keep going until all the milk is mixed in and it is thickened. Add cheese and mix in. Combine macaroni, cauliflower, bacon and onion and cheese sauce. Place in a large oven dish. Mix topping ingredients together and sprinkle over pasta. Bake for 20 mins until golden and crispy.